How much does it cost to travel to Auckland? How much money will you need in Auckland? NZ$182 ($122) is the average daily price for traveling in Auckland. The average price of food for one day is NZ$31 ($21). The average price of a hotel for a couple is NZ$239 ($160). Additional pricing is in the table below. These average travel prices have been collected from other travelers to help you plan your own travel budget. How much money do I need for Auckland? Auckland is located on the North Island of New Zealand on an isthmus between the Northland Peninsula and the other parts of the North Island. Auckland is not only a city but also a region. In 2010 New Zealand combined what had previously been four separate cities into one region. These cities include the southern city of Manukau, the western city of Waitakere, the North Shore in the north, and Auckland City. The City of Auckland is the largest city in Polynesia and is very diverse with many expatriates from elsewhere in Polynesia. This diversity becomes most apparent in Auckland's many festivals and sporting events. 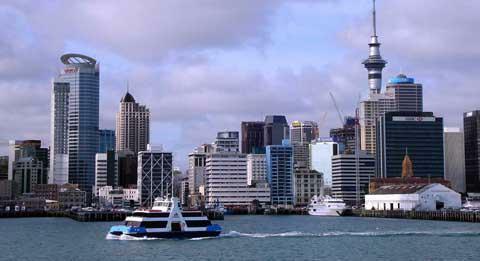 Auckland is both the "City of Sails" and the "City of Volcanoes". The title as the "City of Sails" comes from the many yachts that can be found in the Waitemata Harbour as well as the Hauraki Gulf. It's many volcanoes, all of which are extinct, define its natural landscape. There are about 48 volcanoes that make up the Auckland Volcanic Field. Auckland's climate is temperate and temperatures remain moderate throughout the year. The summer season is between December and March. This is when the sun is at its peak and temperatures are warmest. Between the months of April and June temperatures become cooler and rain is quite common from the end of June through October. There are some interesting sights in Auckland including the Auckland War Memorial Museum, Sky Tower, Auckland Regional Botanic Gardens, and Otara Flea Market. The Auckland Zoo, the StarDome Observatory, and the Auckland Art Gallery are all worth a visit as well. Also consider doing a trip to the Waitakere Ranges about a forty five minute drive from the city. This scenic drive begins in Titirangi and follows a beautiful coastline. You will see impressive waterfalls and some beautiful beaches. The town of Titirangi is an artistic suburb with many art galleries and cafes, making for a nice place to stop. There are a variety of different neighborhoods around Auckland. The Inner City, or the central business district, has the majority of the city's hotels and attractions. This is also where you'll find Viaduct Harbour. Ponsonby is a trendy cafe and artist's neighborhood about five minutes west of the central business district. This area also has lots of boutique shopping. Newmarket is the main shopping district with both local designers and international chains. Devonport is a seaside suburb on the North Shore with a quaint village atmosphere. Mt Eden offers a great view from the top of the mountain. St Lukes is a large mall with a movie theatre, bars, and restaurants. There are many activities that you can enjoy in Auckland. Whether you're an outdoor enthusiast or looking for something a little more cultural, then you'll likely find something you enjoy. For sports lovers there are cricket or rugby matches at Eden Park. For adrenaline junkies, do a Sky Jump from the Sky Tower or try the Sky Walk, which is a 1.2 meter wide walkway that is 92 meters above the ground and has no hand rails. Auckland has an extensive selection of dining options that ranges from budget friendly to high end fine dinig. For the cheapest options head to a food court where you can find affordable Asian food or fast food. There are also many cafes, bars, and takeaway options that are budget friendly. Asian food is very common throughout Auckland and most restaurants are quite good. You will find everything including Japanese, Korean, Vietnam, and Chinese. Other ethnic foods available include Middle Eastern, Italian and Mediterranean. Vegetarian options are also quite common. While Auckland regularly ranks as one of the most livable cities, it does not have a great public transportation system. If you plan to spend any significant amount of time in Auckland, or travel around the city a lot, it is worth it to rent a car. There are buses, ferries, and a train, but the general level of accessibility and frequency can be quite frustrating. You are sure to have a more enjoyable experience if you have access to your own vehicle. Buses are the most common form of public transit but you should plan your trip in advance. Traffic can cause delays in the schedule, but if you're staying in the central business district or inner suburbs, then the wait should not be long. Frequency is highest during peak travel times. If you happen to be staying near a train station, then train travel on weekdays can be convenient. There are five lines to the network and service reliability continues to improve as more investment is made into the system. Most Hostels will charge you a fortune for wireless internet in Auckland, either by the hour ($3 per hour are common) or by MegaByte ($10 for 100MB, prices from 2010), so staying in touch with your friends and family or just uploading your emails can be quite expensive. If you don't carry a computer you can use free computers at the libraries or take advantage of the 6.90 Coffee + Cake special at Esquires Coffee places if you have your own laptop, they will give you a 1h Internet voucher with each order.